Sapa is an appealing destination for domestic and international tourists thanks to its beautiful scenery and moderate climate. At a height of 1,650m above sea level, Sapa has four seasons exchanging within one day and it also has terraced rice fields submerging in the blue sky with white cloud under Fansipan Mountain. Besides, Sapa also has mysterious and cultural characteristics. Interspersing among the rice terraces of Hmong and Dao ethnic people is the Sapa ancient rock field. In this article, Vina.com will expose the main features of Sapa ancient rock field that tourists should know and then consider visiting this ancient rock field whenever having a chance to visit Sapa town. From Sapa town on 4D highway, it takes you about 20 minutes to get to Sapa ancient rock field. Firstly, you head southwest on Xuan Vien (Xuân Viên). Then, you turn right at Mobile Store and turn right onto Silver Falls. Then, you turn left to Dien Bien Phu (Điện Biên Phủ) / 4D highway. Next, you cross Kindergarten O Quy Ho (Ô Quý Hồ). It is about 5.8 km on the right way. Finally, you can see Sapa ancient rock field on your left. The ancient rock field is 10km from the Sapa town center, so you can go to Muong Hoa (Mường Hoa) valley by motorbike and then get trekked to the field. You can travel by a motorbike or hire a motorbike-taxi to get to this rock field. If going by motorbike is dangerous to you, you can get to use a taxi or private car to get to Tram Ton (Trạm Tôn) Pass and then walk to Muong Hoa Valley. For those who would like to keep fit, riding a bike is also a great option. You can find it easy to rent a bike in Sapa, yet you should check the bike carefully to protect yourself during your ride. Another means of transport is trekking. You can trek with a local person or join a trekking tour to the Sapa ancient rock field in Vietnam. Just ensure that you can walk in long hours. Sapa ancient rock field in Vietnam spreads out on the area of three communes of Hau Thao (Hầu Thào), Ta Van (Tả Van), and Su Pan (Sử Pán). 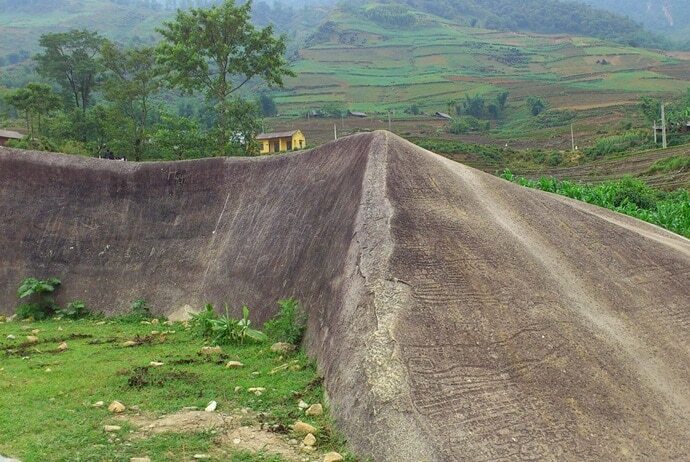 This rock field is located in Muong Hoa (Mường Hoa) valley with an area of 8 km2. 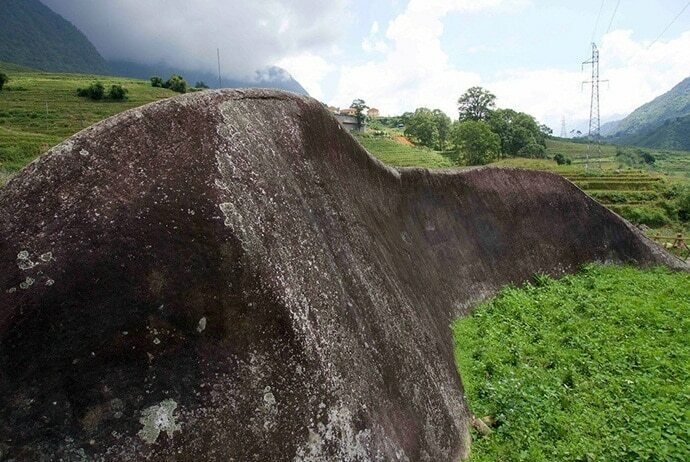 The number of rocks is not too many, but they are the biggest rocks with the length of up to about 12m. The field consists of 159 large and small boulders alternating in trees, in water rice fields or near the side of the road. Initially, this rock field is not impressive at all. However, when you walk along the road, hear the legends and examine the rocks, you can be amazed at its artificial creations. Actually, Sapa ancient rock field gradually becomes a great destination in Sapa due to its special features. Most of the big rocks with special carvings are located in Ban Pho (Bản Phố) village that is a village of Hmong people at the end of Hoa stream. Hon Bo with 6m high and 15m long is the biggest rock. The engravings on the stone’s surfaces are either decorative or pictographic. Especially, tourists can see the carvings of human in different postures: image of persons who are holding hands together, image of a person who is opening the arms with halos around his head, or image of a couple whose genitalia connect with each other. Besides, tourists can recognize the rocks in the shapes of singlet lines, square, rectangular, cross lines, parallel ones, animals, and daily activities, etc. Some other impressive images include the husband stone, wife stone and stones that are shaped like tigers and a stela. The husband and wife stones tell a love story between a couple who met many difficulties to be together. Although they turned to stones, they are still with each other. Most of the scientists supposed that these images were a big heritage of mankind. They not only had great value in spirit, but they also were a mysterious massage by ancestors. This ancient rock field was discovered by French archaeologist in 1925 and they have shown that this ancient rock field has been inhabited many years ago. Then, Vietnamese people remained it in order to draw the attention of both scientists and tourists. According to some ethnographic and historical documents, all of these carvings are clear on pristine era when people totally depend on the nature and this is still a challenge for scientists. It is thought that each brushstroke told a story about the life and culture of the ancient people. This rock field became a natural cultural relic in 1994. 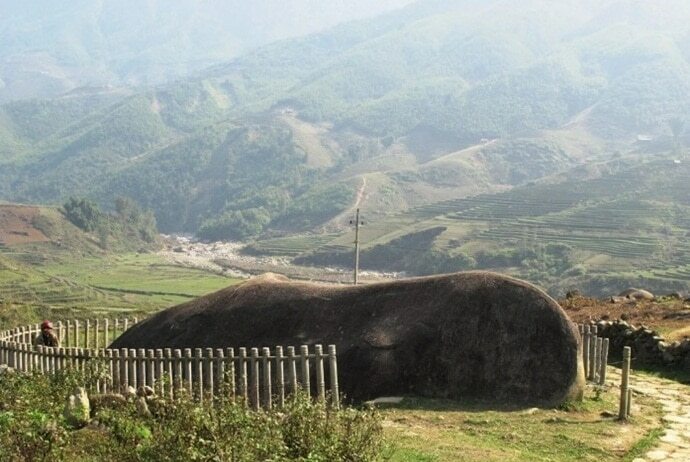 Also, Vietnam has proposed UNESCO to consider this rock field as one of the world cultural heritages. The best time to visit this ancient rock field is from April to October. And, you should not visit this destination at weekend to avoid the crowd. For tourists, visiting Sapa ancient rock field in Vietnam can help them know more about ancient culture. This is actually one of the natural heritages and appealing tourist attractions in Sapa and Vietnam. It not only conveys the pristine beauty of the land, but it also strongly attracts tourists. Over the years, this ancient rock field is still a miracle that nobody can explore completely. So, if you have a chance to visit Sapa, you should visit the ancient rock field in order to discover this precious heritage.